Duplex’s Mike Conroy is pictured at the recent AHCP North West Branch Study Day at the Irish Heritage Centre in Manchester. Mike commented that it was a very well organized day with many interesting speakers including David Bedwell, the AHCP Patron. 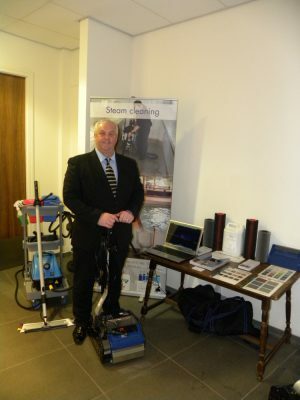 After lunch Mike showcased the Duplex 420/Steam to great effect on both carpets and granite tiles and thanks the potential customers who requested further demonstrations at their NHS facilities based on what they saw on the day.